Are you running your small business from home? Would you like to project a better outward image? Using a virtual office address saves money and looks better. Mail forwarding, call handling and meeting rooms can be purchased on an a la carte basis, meaning you pick and choose particular services at the fraction of the usual cost of a full fledged office. Because virtual offices look just like normal offices, your clientele will not know you work from a residential dwelling. You can reap almost all the same benefits from renting a virtual office address as you would from renting a physical office address. Renting a “virtual office” gives your operations a professional veneer because it uses a commercial location instead of a suburban location. Even if you work from home, you want clients to believe you have the means to afford and occupy office space in a commercial building, unit or industrial estate. Unfortunately, we live in a world where people judge by first impressions. And this is why you must use every trick at your disposal to “look good” right off the bat. It’s very easy for someone to look you up online using digital maps to see where exactly you’re based. A prospective customer may be doing product research by weighing you up against your competitors – the assumptions made about your business could make all the difference. The photographic street view repository Google have created is pretty amazing; it documents almost every road and beaten path in the world. Obviously, this means someone can quickly access pictures of the building you advertise as your business contact address. I’m afraid to say a home address smacks of an amateur. It makes you appear less serious than the competitor who DOES have a credible business location – and that competitor might be working from home too! First impressions count. Allocate the costs, or pay the price. Another big benefit of using a virtual office business address is that it protects your private life. I say this because many self employed persons/business owners might be using a garage or lock-up at home to store their inventory. If that’s the case, you must protect any valuables by not disclosing where you live. Seems pretty obvious doesn’t it? A few years ago I worked on the website of a gent who sold gold jewellery from a mobile trailer stationed on the high street. For security reasons, John could not list his home address anywhere online, yet, at the same time, he needed a business address because a website without one looks bad. For him, a virtual address is a great idea because there was no fear of a burglary at his home and he didn’t have to worry about the excess in the event of an insurance claim. If anyone wants to write to him or if he must provide a business address, the virtual address is perfect. Do you want strangers to know where you live? What if you’re away for a few weeks for holiday time or business travel? I doubt you want the anxiety associated with the wrong people discovering your house is unoccupied. If you are a registered limited company, your details will be available on Companies House, so you should use your virtual office address here too when setting up a company. Under ICANN law you must provide an administrative contact address for any URL you register. These details are logged in the WHOIS database – the proverbial phonebook of web addresses. Anyone can use a WHOIS database lookup service to find whatever address is associated with a given URL. WHOIS operates as a public service. By default, these details will defer to the address you used when you created your registrar account to buy your URL. Thankfully, you can edit any public facing contact details within your registrar account to use a different address like in this WHOIS record for my Small Biz Geek website URL. I use GoDaddy to buy URLs. I just have to remember to access the admin contact details for each URL purchased and change the address from my home to the office. This is something I wanted to bring up because I hear rumours that Nominet are cracking down on private URL registrations for .uk registrations operating as businesses. If you can buy a privacy add-on for the URL, do that too. This will keep your address out of WHOIS completely. 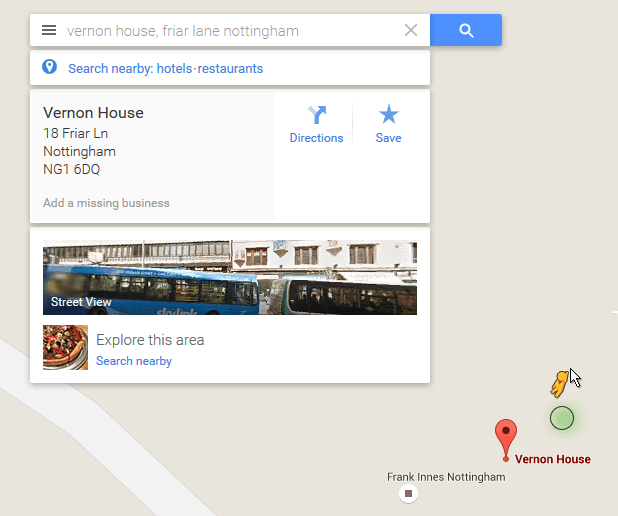 In most cases you can use a virtual office address to register your Google Plus Local (aka Google My Business) page. Update March 2017: Google is now supposedly cracking down on virtual offices used with Google My Business listings. Businesses do this because they want to get a “map pin” on the Google map service. 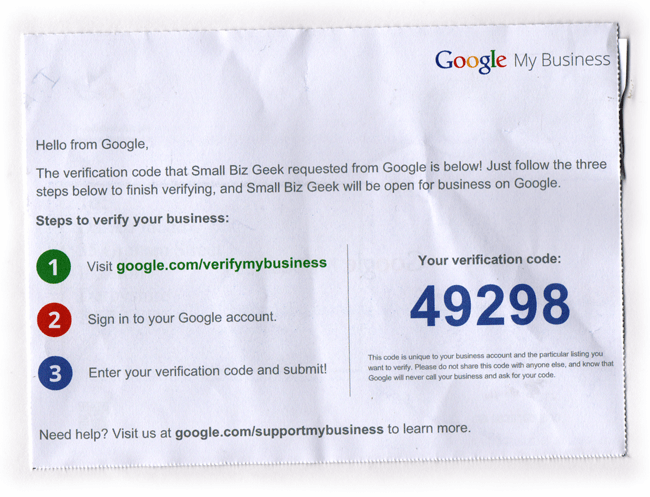 You’ll need to confirm/verify the registration after applying (free) to create your Google business address. You’ll receive a postcard by mail with a unique PIN printed on it. Once your Google PIN postcard arrives at your virtual office, you can go in and collect it, or have it forwarded to your home address by the virtual office provider. Until you verify the page the edits will not be published live. I strongly recommend you get the address registered because Google maps have a lot of clout in search marketing. Many searches for local services/products result in users looking at the local business listings provided by Google Plus Local. One other thing: be sure to use the free local online business directories that exist for most major towns and cities. Local directories are basically a collection of business listings with maps, reviews, backlinks and other features. Local business directories often rank well for local searches but will require a local address. For example, if you want to get into a half decent Nottingham focused biz directory, you’ll need to use a Nottingham address with an NG postcode. Another technique you can use to increase your chances of showing in relevant search results is to make sure your website features your business address on the “contact” page and in the footer of every webpage on your site. These pages will earn a little more ranking power if those town/city/postcode keywords are present, and those words will be part of your virtual address. Mail forwarding is a real god-send if you’re trying to keep your residential home address private. 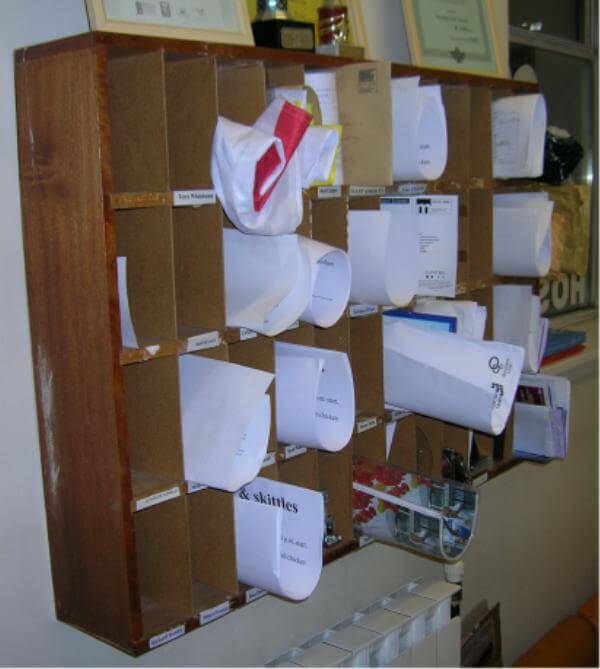 It means you can receive postal correspondence at your virtual office in a designated postbox inside the building. Usually you go in and pick it up mail yourself, or set up an agreement with the provider that they will send each piece of mail to you for a fixed fee per item. Normally, this is just the price of the stamp although some providers may ask for a subscription on top. It’s useful to use mail forwarding if you’re dealing with paperwork between yourself and a client. Unless you do remote/mobile consulting, having access to meeting rooms is a big benefit. 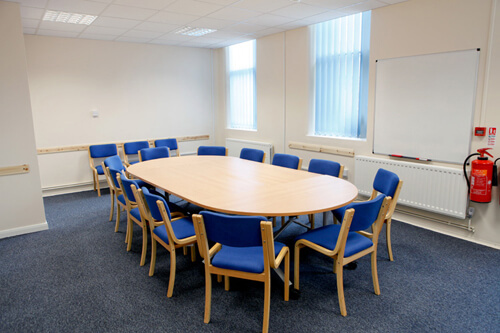 Many virtual offices provide conferencing suites or meeting rooms on an hourly basis for a fee. Many virtual assistants, for example, work from a spare bedroom or kitchen table and might prefer to keep their domestic situation separate from business. I’m reminded of Bob Odenkirk as Jimmy McGill in the AMC series Better Call Saul. The truth of the situation is that McGill’s actual “office” is a dingy backroom storage area of a nail salon because he cannot justify the expense of a full serviced office. James Caan, former BBC Dragon’s Den investor, started his recruitment company Alexander Mann in a tiny windowless office on the prestigious Pall Mall in Westminster. The office was so small, it wasn’t fit for purpose. It only really served as a pretext to use the words “Pall mall” as the address on his business card. My point is that it’s better to pay a small fee for an hour or two in a quiet meeting room. A good office building at a town or city location is a good idea, assuming of course, you book well in advance. Do some research and see if there are any providers in the nearest town or city. 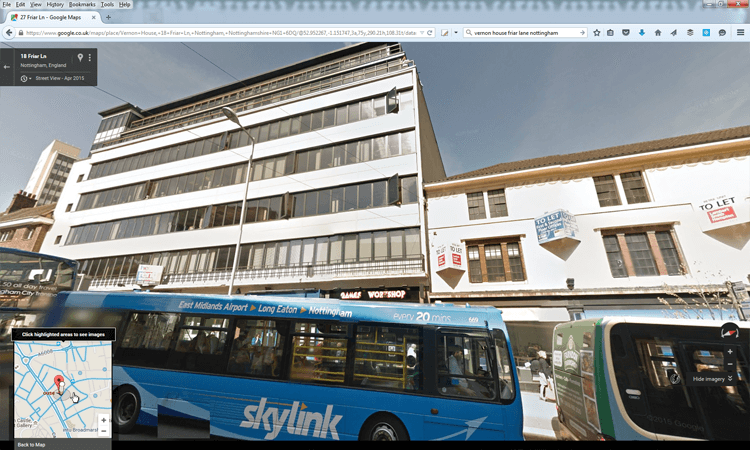 I am from a small town called Ilkeston and there is only one provider of virtual office space here. However, if I go to Nottingham, 9 miles away, there are dozens of providers that I can use, and pricing is competitive. You might get better leads because large cities usually have a better economy and attract investment. Bootstrappers and budget start ups can squeeze many benefits from a relatively cheap virtual address. Lend your outward image some razzle-dazzle in addition to the technical and logistical advantages. Remote working is so common these days, that some companies do not have a fixed location whatsoever. Many of us now work in the cloud, online and alongside virtual assistants. Yet potential customers still appreciate the idea your business can be physically pinned down to good old fashioned bricks and mortar. Being next to all the other service providers is somehow reassuring. It’s better to start our business in a good location because the address of the office is very important. This is a great post. Main takeaways: by choosing virtual office rentals you will: have a professional business address in an area of your choice, keep you and your family’s whereabouts private, save money on office space rentals, have the ability to join Google My Business, get on Google Maps and local search results and list your business on local business directories and you can hire affordable meeting rooms and conferencing facilities when necessary. Nice wrap up! 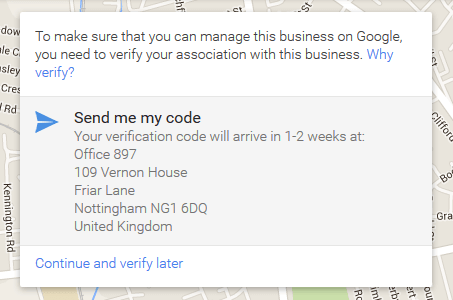 There is a crackdown on using a virtual office address for Google My Business. It is actually against the terms of service to do so since a map location should only be used if the public can drop in and visit. Since those of us working from home often don’t have clients visit us, we’re really supposed to set a “service area” in Google My Business. I don’t know that this is important so it is enlightening for me to see its benefits. Thanks Darren. All points are helpful. It is absolutely true that virtual office is really the best option to start your new business. Because in a virtual office, business address is that it protects your private life. Hi Hary, Deep insight. To get listed in Google people recommend to get unique numbering of address to prevent google from blacking out. I too utilize a virtual office solution for my business with unique numbering to tap advantage of Google Neighborhood algorithm. I discovered more recently that using a virtual office for Google My Business is against the terms of service. It could even be a reason behind reviews being filtered from the Google account associated with the location. I really like your article it’s very in depth and covers a lot of the pros and cons of virtual offices. Personally I think there are more benefits to be had than cons but that’s just my opinion. Lots of images and some nice little SEO tips in there too which is always nice to see. I’d be happy to share this article on my blog in the future. I wrote my own article on Virtual Offices. You can check it out if you fancy..